Google the number 7 and you’ll discover its significance down a deep dark rabbit hole. Scholars believe it represents completeness or perfection in the Bible. Ironically, in western culture and especially related to marriage, it is often used in the context of the “7 year itch”. Ha! When my husband and I got married, I made it a goal of mine to draw a cartoon for him each year on our anniversary. Guess how far I made it… one year… yep one, lousy stinkin’ year. Today marks our 7th year of marriage so I decided to draw up something. Once every 6 years ain’t bad, eh? This year has been an incredible year for my husband career-wise. He’s now flying with Canada’s national airline, flying the 777’s no less! 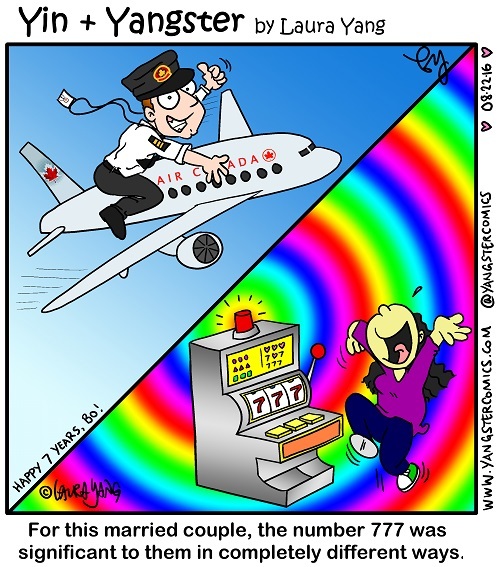 To me, 777 doesn’t conjure up images of Boeing’s long-range wide-body twin-engine jet airliners, but rather… well I guess the cartoon speaks for itself. No, I have never won a huge jackpot like that BUT, the closest perhaps is when I got married to my husband.